You are today invited to witness the unveiling of a Memorial Tablet, and the opening and dedication of Memorial Park. It is sincerely hoped that this Memorial erected to the memory of those boys contributed by our Borough to our nation in the greatest war in which the world has ever participated will meet with your entire approval. In order that you may have a better understanding of the Bronze Tablet on the front of the Memorial, we give you below an explanation by the sculptor, which we believe you will find of permanent interest. The figure holding the laurel wreath over the dedication represents Liberty. The action of the figure is sentimental rather than heroic. The sculptor has emphasized sentimentality for the purpose of expressing the same feeling which possessed the soldiers and sailors participating. Some of the boys died, and most of them went though great suffering which is reflected in the figure, the face of which expresses innocence and love, even as a mother feels toward her children who through brave deeds accomplished something noble and who in accomplishing it had to suffer and make sacrifices. As the sculptor expresses it, the American soldier and sailor were the children of Liberty. The young figure representing Liberty likewise represents the spiritual mother of the boys. The unselfish spirit with which the United States entered the War is symbolized on the Tablet by placing the American Emblem, of which but a part is visible behind the figure. Here Liberty does not represent America alone; she is here a symbol of liberty for the whole World through the American spirit. The tender position of the left hand is in harmony with the whole figure. The expression of the face is striking and it was the sculptors intention that it should express happiness, satisfaction and love. Armistice Day, November 11, 1918, was a day of great celebration throughout the nation, and Hasbrouck Heights joined enthusiastically. An impromptu parade was hastily organized, marching noisily up and down the streets of the town. People gathered in small and large groups and far into the night they joyously celebrated the end of hostilities. In the minds of many that night ran the sobering thought that there would be twelve Hasbrouck Heights sons who would not return, and that there should be some fitting memorial to them as well as to the others who had served their country. Thus was born, in the midst of celebration, the idea of Memorial Park and the Memorial Monument. Within two months the Mayor and Council had purchased and taken title to that small triangular plot of land between the old and the recently straightened Terrace Avenue, from Henry Street to Passaic Avenue. Following weeks of almost continuous session for the Council, the most memorable meeting was "the all-night session of April 15th" when the list of names to be placed on the monument was completed. 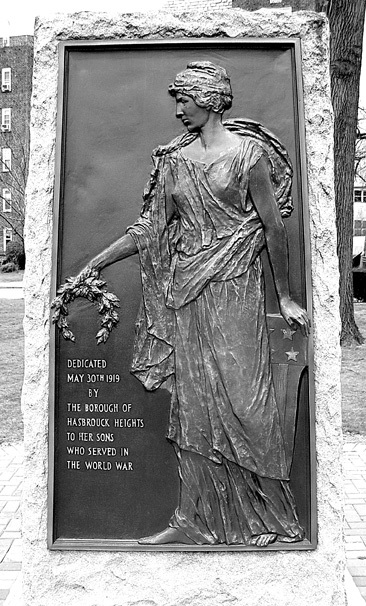 At the same meeting the inscription for the monument was adopted: "Dedicated May 30th, 1919, by the Borough of Hasbrouck Heights to her sons who served in the World War." The many details necessary to complete such a project in so short a time -- from the grading of the park to the purchase of a granite stone, tablet, flagpole and ornamental lights -- involved a vast amount of work. All went well, however, until the afternoon before Memorial Day of 1919, when the monument was to be dedicated. Then it was discovered that the monument had been lost somewhere on the way from the quarries in Vermont to New York. The stone was found in a freight yard near Mt. Vernon, N.Y., and a special locomotive hauled it to the terminal. With much difficulty it was finally hauled to Hasbrouck Heights that night. There was another major obstacle to hurdle. The contractors refused to set up the stone. Citizens came to the rescue, and with the assistance of members of the Council they worked all night. Half an hour before the dedicatory services began all was in readiness. Thus the first Decoration Day service in Memorial Park occurred -- nor has there ever been a lapse in these exercises in all the intervening years. Mayor Webb and Councilman Edmund E. Field, Sr., were credited with being the prime movers in the Memorial Park and monument project, and records reveal that Hasbrouck Heights was one of the first towns in the State of New Jersey, if not the first, to erect and dedicate a permanent monument to its heroes of World War I. In later years, twelve Norway maple trees, stretching the length of Memorial Park on the east side of Terrace Avenue, were dedicated to those who lost their lives in World War I, and in 1943 a temporary Honor Roll of the men and women again serving their country in war was dedicated. Following the organization of the national American Legion in the spring of 1919, some thirty veterans of World War I met at the Public Library hall on September 3, 1919, and formed a Hasbrouck Heights Post, naming it for Captain James B. Scarr, who made the supreme sacrifice for his country on June 6, 1918, at Chateau Thierry. Francis J. Scarr, Captain Scarrs brother, was elected first Commander of the Post. Other officers were M. M. Sheedy, vice-commander; E. E. Ellis, finance officer; A. E. Browne, adjutant; Henry G. Weimar, chaplain; and Frederick R. Coyle, historian. To uphold and defend the Constitution of the United States of America; to maintain law and order; to foster and perpetuate a one hundred per cent Americanism; to preserve the memories and incidents of our association in the Great War; to inculcate a sense of individual obligation to the community, state and nation; to combat the autocracy of both the classes and the masses; to make right the master of might; to promote peace and good will on earth; to safeguard and transmit to posterity the principles of justice, freedom and democracy; to consecrate and sanctify our comradeship by our devotion to mutual helpfulness." For a number of years the local Legion had headquarters in the old First Reformed Church, now the Young Peoples Hall of the church, and it was called Legion Hall. With the prospect of one day welcoming returning veterans of the present global conflict, the Legion in 1943 took preliminary steps toward the establishment of a "Legion Hut" and community center in Hasbrouck Heights. Those plans are daily taking on more concrete form, and early this year, with an eye toward the future and the increasingly important place the American Legion will hold in the community, the Mayor and Council leased a piece of Borough-owned property at the southwest corner of Boulevard and Henry Street to the Legion. The Legion hopes, as soon as building materials again become available, to build a Legion home and community center on the site. James F. Tangney is the present Commander of the Post. Other officers are John F. Ryan, Joseph Keogh, Peter Garison and Turner C. Blaine. Two years after the organization of the Legion, the American Legion Auxiliary came into being, and it, too, has fulfilled a civic role through the years, ever closely identified with all welfare and patriotic endeavors in the Borough, and never forgetting its principal objective: service to the disabled and needy veterans and their families. It has raised funds for this work in annual Poppy sales in town. The Legion Auxiliary, as did the local Legion, took an active part in helping to make possible the Bergen Pines therapeutic pool for convalescents at the County institution. One of its most recent activities has been the addressing of wrappers in which the local newspaper is sent without cost each week to members of the Armed Forces from Hasbrouck Heights. Membership in the Auxiliary is limited to the mothers, wives, daughters, and sisters of all men and women in the Armed Forces during both World War I and World War II, who are members of the American Legion. The first president of the Legion Auxiliary in 1921 was Mrs. Michael Sheedy. Mrs. Leland C. Benton is now president. Serving with her are Mrs. William Doonan, Mrs. Charles Wente, Mrs. Turner C. Blaine, Mrs. Minnie Bossert, Mrs. A. E. Browne, Mrs. B.  Bids were opened for the construction and erection of a memorial monument. The Dymalkon Company bid $2,100 for a monument F.O.B. New York. Mr. Emile Lessieu asked permission to show a model of a monument which he said could be built for something like $2,000.  Resolved that this Council extend a formal invitation to the sculptor, Mr. J. Kilenyi, 20 East 90th Street, New York, to attend as guest of the Borough the unveiling of the memorial tablet the front panel of which was modeled by him.